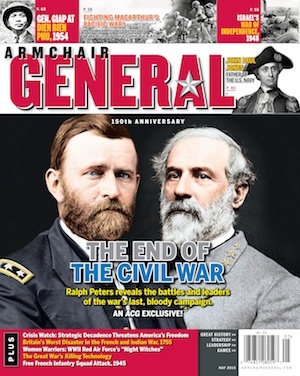 The ACG Advisory Board | Armchair General Magazine - We Put YOU in Command! In case you were ever in any doubt, every issue of Armchair General magazine is overseen by an advisory panel with a wealth of historical expertise and experience. General (Ret) Harold G. “Hal” Moore is a true American warrior and co-author of the book We Were Soldiers Once … And Young. Carlo D’Este is a renowned World War II historian and best-selling author of Patton: A Genius for War and Eisenhower: A Soldier’s Life. He is also Armchair General’s consulting historian. James Lighthizer is president of the Civil War Preservation Trust, the national organization leading the fight to protect our threatened Civil War battlefields. Brig. Gen. (Ret) John W. “Jack” Mountcastle, PhD, is a highly decorated combat veteran who was formerly the chief of military history and commander of the U.S. Army’s Center of Military History in Washington, D.C.
Ralph Peters, a retired U.S. Army intelligence officer, is the author of Never Quit the Fight and New Glory: Expanding America’s Supremacy as well as 19 other books. He is also an acclaimed columnist and strategist who appears frequently as an expert commentator in the broadcast media. John Rose is an exceptional research historian who has extensively studied the history of America’s fluid and transformational frontier era. Barnet Schecter is a Yale-educated scholar and noted historian who specializes in military history related to New York. His is also the author of The Devil’s Own Work: The Civil War Draft Riots and the Fight to Reconstruct America and The Battle for New York: The City at the Heart of the American Revolution. Douglas D. Scott, PhD, is a widely recognized authority on military archaeology and frequent commentator in broadcast media. His books include Archeological Perspectives on the Battle of Little Bighorn and They Died With Custer: Soldiers’ Bones From the Battle of Little Bighorn. Ben Weider, C.M., C.Q., PhD, is a Canadian international entrepreneur and founder and president of the International Napoleonic Society. He is also one of the world’s foremost authorities on the military genius who invented modern warfare. His books include Napoleon: The Man Who Shaped Europe and The Murder of Napoleon. William H. “Wild Bill” Wilder is a popular wargame designer. He has extensive experience in scenario design and game development and has worked with seven gaming companies over the past 11 years. I abstxruse somerthing here. Acknowledgment for postng. I am secreatry of the Society of the Vietnamese Airborne, a group of advisers from the VN War. Would like to contact LTC(Ret) Ralph Peters via email to discuss the Society and Vietnam.